One favorite snack that’s tried and tested by the Filipino palate is the banana cue. And for all those out there who are already into the business of selling banana cue or interested in getting into this kind of snack food business, here’s one more recipe to make sure no part of the banana cue goes to waste. With the peel of the banana (saging na saba), you can actually make a yummy burger patties! 1. Shred the banana peels with your hands. Remove the parts that are dark and hard. 4. Wash properly with water to remove the salt and other impurities. 5. Using a kitchen knife, chop the peels until fine. 6. Put the chopped peels in a bowl and flavor with oyster sauce and pepper. Add the flour and mix. 7. 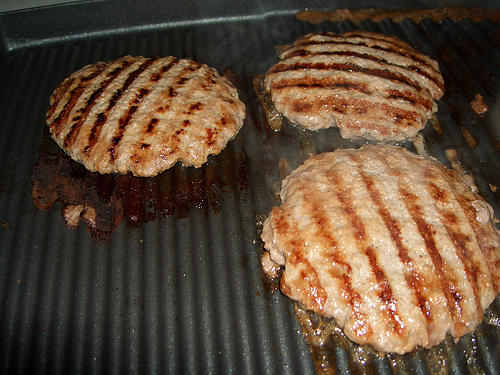 After mixing, use a spoon to get from the mixture, then roll, form, and flatten the patties by hand. 8. You’re burger patties made of banana peel is ready for grilling or frying. * with 7 pieces of banana pee, you can make 1 kg of banana burger patties. ang shelf life ni2 ok lng bah? hello hindi po ba ito naccra Zyree Ecleo Salumag? yan yung lumabas nung type ko tungkol sa banana patties.. I also doing that for almost 10 years.